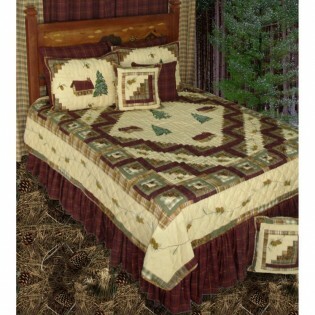 A trail of embroidered pine cones borders the traditional log cabin quilt squares that frame a center motif of cabins and pine trees on these rustic Forest Log Cabin Quilt Sets. The Log Cabin and Pine tree theme is again featured on the coordinating pillow shams. A trail of embroidered pine cones borders the traditional log cabin quilt squares that frame a center motif of cabins and pine trees on these rustic Forest Log Cabin Quilt Sets. The Log Cabin and Pine tree theme is again featured on the coordinating pillow shams. The ensemble is further enhanced with the addition of the plaid dust ruffle.